Seitan is a very versatile food type as these seitan recipes demonstrate. Seitan has long been a popular ingredient in Asian and oriental food. It is created from wheat gluten and has a chewy meat-like texture. The texture, plus the fact that it is high in protein makes seitan a popular food for both vegetarians and vegans. 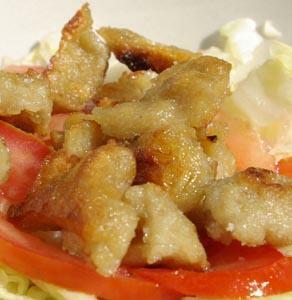 One of the benefits of seitan is that it can be enjoyed as a food on its own, for instance sautéed and eaten with salad, or it can be used as an ingredient in a recipe. Seitan is a popular meat substitute and can be used to replace the meat ingredients in a wide variety of dishes such as burgers, sausages, meat loaf and more. When it is unseasoned, seitan has a naturally bland taste. This helps to make seitan a versatile ingredient as different blends of herbs and spices can be combined to create different flavors of seitan. Unseasoned seitan is also ideal for using in casseroles or stews where it can take on the flavors of the rest of the ingredients. People will have their own preference as to when they add seasoning. Preparing unseasoned seitan and then adding seasoning in the final step allows for many variations to be created from a single batch of seitan. Adding herbs and spices to the wheat gluten powder is a great way to make a tasty dish. This is perfect for eating on its own with just salad or vegetables. This can also be used as a filling for sandwiches or wraps. The seasonings are added to the dry ingredients. See How to Make Seitan for a step by step guide. The following recipes can help you get started using seitan. Mix all the ingredients together, knead well and form into sausage shapes. Cook in boiling water. The finished chorizo-like seitan can be eaten cold or lightly fried in olive oil. Mix all the ingredients together, knead well and form into balls or patties. Cook the seitan in the boiling stock. This works well in stir fries. 1 teaspoon of cumin, coriander and onion seeds that have been toasted in vegetable oil. Mix the ingredients together, knead well and form the seitan into patties as required. Cook the seitan in boiling water. The finished tandoori style seitan can be cooked in a curry sauce, eaten as it is with rice or served with naan bread and a selection of Indian pickles. Look for wheat gluten powder or flour (sometimes called vital wheat gluten). Normal wheat flour cannot be substituted. Do not use a food processor to mix the gluten powder and water. The gluten mix is much too rubbery for a normal domestic processor and it could cause the engine to burn out. Do not allow the simmering seitan to boil dry. If you have never tried making your own seitan, why not have a go? You may be pleasantly surprised!